Understanding Your Credit Score | The Consumer Law Group, P.C. Why do I have different credit scores and what do they mean? Everyone seems to want to know your credit score—banks, lenders, landlords, even your employer. You hear friends and family members brag about their scores, but you don’t even know what your score is. How important is a good score? Where can you find out what your score is? We answer all those questions here. If you don’t know what your score is, the first step is to get a free copy of your credit report. You are entitled to one free report each year from each of the three national credit reporting agencies (CRA): Equifax, Experian, and TransUnion. Each of these agencies differs slightly in the kind of information they gather, so it is recommended that you check each report every year. Along with information on bank accounts and lines of credit in your name, the reports will also give you a credit rating, or score. When people refer to their credit score, they are most likely talking about their FICO score. Fair Isaac, Inc., invented the three- digit credit scoring system in the 1980s and their score is the one lenders most often use to evaluate your application for credit. To calculate your score, FICO takes information from each of the three CRAs and determines a separate credit rating for each CRA. In other words, your FICO score from Equifax may not be the same number as your score from TransUnion, but they will be close. FICO uses a scale from 300 to 850. While every lender sets their own cutoff points, a FICO score above 750 is generally considered to be excellent and a score below 600 is considered to be poor. To make matters confusing, however, when you order a free credit report from one of the three CRAs, the score you will see will be one that the agencies created called the VantageScore. While this system is gaining popularity among lenders, it is still not as commonly used as the FICO score. Originally based on a scale of 501-990, VantageScore is now on a scale from 300 to 850, like the FICO scale. 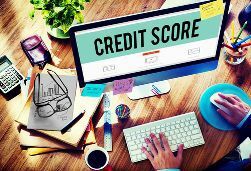 Again, your VantageScore may differ slightly among the three credit reporting agencies, but the numbers should be close. VantageScore and FICO weigh various factors differently when determining a score, but what they have in common is that the higher your score is, the better it is for you when you are applying for credit. Lenders that we often deal with will not consider a mortgage on your house with a score less than 620. So it is important to get any incorrect negative information off of your credit report. The information on your credit reports and the various credit scores assigned to you are very important to your financial future. If there are errors on any of your credit reports, it’s important that you take action to correct the errors. We can help. Contact our office in Richmond at (804) 282-7900 to find out how.